Recently we made a short trip of two nights to one of the most beautiful union territories of India with pristine beaches that probably recharged us and filled with vigor. This weekend gateway became more amiable because of the splendid hotel that we chose for two nights. A superb beach side hotel where you can enjoy a beautiful sunrise….Off course if you are an early bird or can try to be one for few of the mornings and Greet Sun with stupendous energy. The hotel which we are talking about and would love to recommend to all if you are staying at Diu.A mesmerizing swimming pool, wonderful breakfast, a well-coordinated staff who exactly knows what their guests want, beautifully decorated rooms and beautiful beach waiting to drench you – the beach that is just outside of the hotel. What else do you want in your hotel which you have chosen for your beach vacation where fun & frolic will be at its galore? Stay in Radhika – Beach Resort and get indulged into a blend of luxury and laziness staying in this wonderful beach side resort which truly understands the value of your money. Go through the pics and get acquainted with this wonderful hotel. A beautiful idol of Lord Krishna and Radhika just at the reception of the hotel. Enjoy sipping your morning coffee and a majestic view of the pool just outside your room. Quite a memorable experience in this splendid pool. We spend hours relaxing and swimming by this pool. 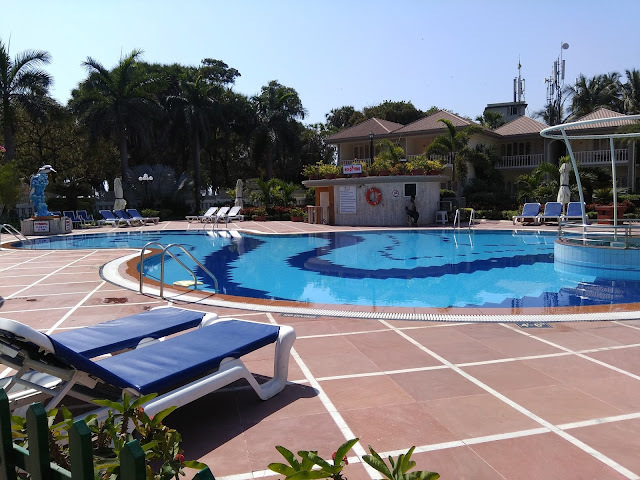 Go for sightseeing in Diu after enjoying in the beautiful swimming pool. Go through the post of “ Top places to visit in Diu “ coming soon up on the blog. Return to the hotel in the evening. The hotel has a beautiful Bar and Restaurant called Rivera where you can enjoy scrumptious food and wine at night. Stay tuned and connected for our next post "Top places to visit in Diu ". We enjoyed a lot here. Thank you for sharing these beautiful places with the readers. This will help someone to select a best location for their memorable moments. Visit here for more info.